I found this document on FamilySearch.org in alphabetized Estate Records for Elbert County. I'm confused by it and hoping someone can provide some insight. I'm reading that John Craft Sr is being made guardian of John Craft Jr and Willis Craft, sons of John Craft Sr. Is this record giving guardian ship of a father to his sons, or are there two John Craft Seniors? 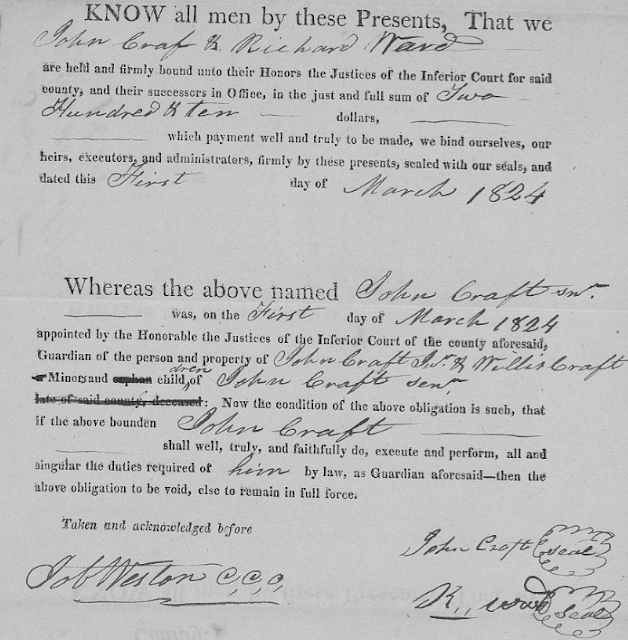 Where John Craft Sr is named as the father, the words "late of said county, deceased" are crossed out, indicating that he is alive. But why does a father need to be named guardian? This record is in the Estate Records; is he becoming guardian of property they have inherited? Unfortunately I don't have the answers to your questions. Hopefully someone who reads your post will be able to help you out with this. While I don't have an answer either, the date of the guardianship suggests it is entirely possible that the Sr and Jr designations simply distinguish an older and younger John Craft. Maybe the older was an uncle or grandfather. It's not possible to tell with just this document, but this type of guardianship was common when a minor inherited property or money. The guardian would often be a parent but was not always, even when the parent was living. As you have noted, the senior/junior do not necessarily mean the two men were related but do not preclude it either. Unfortunately, the only way you're going to get the answer to this is by continuing to dig in the records.